Imagine two rivers that are identical; same climate, same lithology, same vegetation, same grain size, same slope, same everything. Now imagine that faults deep in the earth shifted and the groundwater network, the plumbing, of these two rivers become different while the physical characteristics of the rivers remained the same. Let's say one river had a constant flow rate that never changed over the course of the year, while the other river experienced small floods during the rainy season and, on rare occasions, a big flood. Many years after the flow history of these two rivers diverged, scientists from Oregon State University came along and found that the total amount of sediment transported by the rivers was identical! Meaning each river performed the same amount of geomorphic 'work,' but one did so slowly and steadily, while the other did so during short but intense flood periods. The questions I'm interested in answering are: what do the two rivers look like? How are they similar and how are they different? How do differences in the flow rate over time lead to differences in the appearance and structure of the channels? The latter question is central to my research. Unfortunately, there are no study sites as perfect as the one described above, so instead I've done extensive work studying and comparing streams in the Oregon Cascades, where the geology is such that end-member hydrologic systems are found within the same landscape. Those include stable, spring-fed streams and flashier surface-runoff streams. A key aspect of spring-dominated streams is that flows are near constant and vary by less than a factor of 2 over the course of the year, rarely exceeding bankfull. In contrast, flow in highly variable runoff-dominated streams can vary by as much as two orders of magnitude. 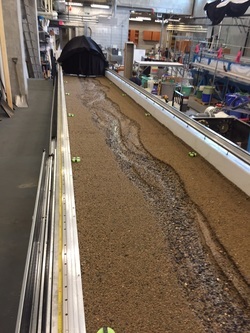 The next phase of my research will be conducting flume experiments to test these ideas in a controlled lab environment. You can read more about each phase below. For the more scientific description of my research, you can download my PhD proposal below. ​As part of a larger project investigating the impact of changing climate on snowpack and streamflow, I collected detailed geomorphic surveys of both spring-fed and surface-runoff streams in the Central Oregon Cascades. I then examined changes in the timing and magnitude of bedload transport under modeled flow scenarios to identify which rivers draining the Cascades with different hydrologic regimes are most vulnerable to increased frequency of bedload transport. Such increases in the frequency or magnitude of gravel entrainment might lead to disturbance of fragile salmon or bull trout habitat. 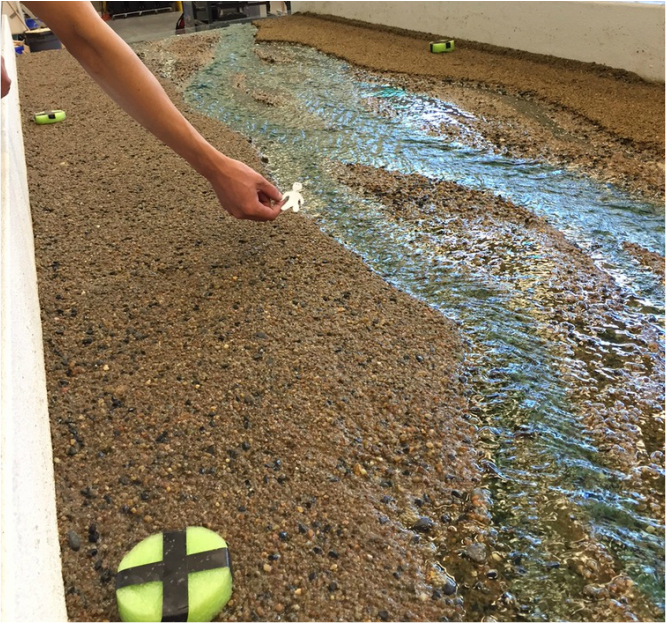 We calculated bedload transport rates using field measurements of surface sediment size, channel geometry, and channel slope along 14 reaches that included streams with a range of drainage areas and flow regimes (i.e., spring-fed and runoff dominated). We found low levels of transport occur year-round in the spring-fed channel, which is notably different from the snowmelt-runoff channel where transport rate is near zero for about 1/3 of the year but increases by five orders of magnitude during the wet season. We then examined bedload transport under 3 climate warming scenarios, +2degC, +4degC, and +4degC with a 10% increase in precipitation. Our findings suggest that both spring-fed and surface-runoff streams are vulnerable to predicted changes in the flow regime, but in different ways. We found that under all warming scenarios, daily deviations from baseline in discharge and consequently sediment transport rate are more frequent and more pronounced in the snowmelt runoff system. The spring-fed system will experience larger peak flows (up to 16% higher) and an increase in the number of days in a year with flows greater than historical flows (at least 25% greater) by 67 days. In comparison, changes in the snowmelt runoff systems will be even larger, the highest flows will increase up to 85% and the number of days in a year with flows greater than historical flows (at least 25% greater) will increase by 135 days. Consequently, daily sediment transport rate in the snowmelt-runoff system will be up to 200% different from baseline under warming scenarios compared to only about 60% different in the spring-fed system. Deviations from baseline in the snowmelt channel also span the entire year rather than just the winter flood season. Even though total runoff decreased in the snowmelt channel, transport rate went up by a much larger margin because the frequency of peak flows, which transport the majority of the sediment, increased. Therefore, changes to the hydrologic system do not result in an equivalent change in transport capacity and changes to the distribution of flow are as important as changes to the volume of flow when predicting transport capacity response. Results from this work were presented at the AGU fall meeting in 2013 and 2014. You can see the posters and our final report for the Northwest Climate Science Center by clicking the links below. Stay tuned for a publication! ​For this project, I studied whether the type and arrangement of woody debris in mountain streams reflect the underlying flow regime. To answer this question, I compared wood loading, piece orientation, location, and jam architecture in two end member hydrologic systems, including both stable, spring-fed stream and flashier surface runoff streams in the Cascade Range of the Pacific Northwest. Differences in woody debris are so great that characteristics of woody debris can actually be a useful field indicator of overall flow regime. Wood in stable, spring-fed streams is largely immobile (83%), found as a single piece (67%) or as part of an open-fabric log jam (33%), and is near perpendicular to channel, indicating little movement since emplacement. In a real sense, wood becomes part of the channel and represents the dominant structural feature in these channels, accounting for a large fraction of total flow resistance and form drag. In contrast, the majority of wood in runoff-dominated streams is mobile (83%), has stripped bark (86%), occurs in densely-packed log jams (84%), and is found parallel or sub-parallel to the channel, all indicators of frequent fluvial transport. In these systems, wood moves through the channel quickly and is a much smaller component of total resistance. We concluded that wood patterning and mobility do reflect the degree of flow variability in a stream, and that differences in wood architecture control channel stability and key channel structures. Understanding how flow regimes control wood accumulations and patterns is therefore fundamental to properly interpreting the geomorphic and ecologic role of wood in streams. These results were presented at the 2015 AGU fall meeting, you can download a copy below! This work is graciously funded by a 2015 CUAHSI Pathfinder Fellowship. The experiment in this picture was designed using a 1:30 length scale ratio. If a 2m tall person stood next to the 'river,' here's how tall they would appear!